Errr… This post is somewhat going to be a bit long. The recipe is simple, short and unique. You can always scoot down to the recipe but you won’t know what you are missing out on the next few Para’s. This recipe and the post is a tribute which if I did not do I will not be able to consider myself worthy. Last Friday Evening we packed our bags, loaded out car and started for my Hubby’s hometown to attend his family temple’s “Kumbhabhishegam”. The next day was spent in the arranging the things needed to be taken to the temple. There was a big gang and on Sunday we all left in an arranged van plus the car in which the pooja items were loaded. The celebrations all went well and we had a great darshan too. But the crowd was huge and with all the pulling and pushing around we all got real tired. As I was fasting I did not get to eat anything and the head ache was just starting. On the way home the car in which me and my MIL were travelling with the pooja items and vessels got punctured and others had left in the van. I rang up Hubby dear to inform of our plight, told him not to worry and we shall be returning a bit late. The driver did not have a spare tyre and he left with the wheel to the nearby town leaving us both stranded in the middle of no where. We both decided to go the nearby and the only house left in the vicinity to get some water. I was a really hesitant to go to a strange house, but I need not have worried at all as it turned out to be a memorable moment for me. There was an old man sitting on a wooden chair reading newspaper and an old lady nearby knotting jasmine flowers into a garland. I told them of our plight and she asked us to have a seat, gave us water and I just don’t know how the old lady found out that I was so damn hungry, she went inside the house and while we were chatting with the Grandpa she came back with hot fluffy idlis and this lip smacking chutney on a banana leaf and asked us to eat first. Only when I was eating did I realize that it was the best meal I had eaten in a very long time. Was it because of hunger or not, I do not know but the setting was so right. There I was sitting under the mango trees, eating while listening to the cows in the nearby shed mooing, rustle of dry leaves, cluttering of few hens with their entire brood intently picking the sand, chirping of the birds and squirrels, surrounded by the smell of jasmine flowers, freshly cut hay and enjoying the swaying movement of the coconut trees. It was like perfect setting from one of the rural movies. The Chutney was the best I have ever tasted and I asked the old lady for the method and she was so delighted to tell me. She gave us a tour of her house and talked about her own family. When it was time to leave as the driver had come back I touched her feet to get her blessings and her eyes just misted. She told that she gets to live to see her own grand daughter becoming like me. Oh Boy! I felt the prick of tears at the back of my eyes too. I pray to God that she does, with her being such a kind hearted soul . We both thanked them profusely for their generosity and hospitality bestowed upon us and headed home. I just can’t think of the same thing happening in the city or the people being so generous. Hence this is a tribute to that amazing old couple who were so generous and kind to us in a moment of need considering the fact that we were total strangers to them. As said here is the recipe of the simple yet delicious chutney which I followed to the T as said by that lady. Heat a kadai and add the oil. Let it smoke and switch off the stove. Immediately add the whole red chillies and roast it in the heat of the oil. Drain it on to a plate. This is to let the spiciness of the chillies into the oil and to prevent them from getting blackened. Switch on the stove and when the oil is hot again add the garlic pods. Sauté till the garlic starts changing color and the outer skin gets shrinking. Transfer to the same plate. Now place the whole tomato in the hot oil and simmer the stove. It has to cook in the hot oil slowly till the skin gets totally shrunk. At this stage when you press the tomato with a ladle it would have softened considerably and almost half cooked. Keep changing sides while it is in the oil. Switch off stove and let it cool. Keep the oil in the kadai as it is. Grind the red chillies, garlic, smoked tomatoes, tamarind and rock salt to a fine paste. I did not add any water at all as the moisture in the tomato was enough for it to become a smooth paste. Transfer to a dry container. Add the oil left in the kadai to the chutney and mix well. There is no seasoning for this chutney as doing so will alter the taste and authenticity. Serve it with hot idlis and dosas. This was so delicious that my hubby and kids had them with rotis, puris and bread too. Even after following the recipe to the dot, I found a marked difference in the taste. That may be because she ground the chutney in the grinding stone manually and I used a mixie. The next thing must be because she told me that she always uses cast iron kadai “Irrumbu Chatti” whereas I used a non stick one. I used the pods from 6 bulbs of garlic shown in the pictures. Use “Naattu Poondu” the smaller variety for more flavor and not the Chinese garlic. Adjust the whole red chillies to your spice requirement. BTW, do you like the new Mortar(l) and pestle that I brought back. I was fooled by its size and it is really heavy. I would like to send this to Sravani’s CC-Roti Pachadi/Chutney and to Iftar Nights by Jabeen. Thank you for reading through this post so patiently and now for some cool and refreshing clicks to soothe your eyes of the lushness that I clicked. I really would not mind a home among this lush green field. How about you? Arun trying to get better acquainted with the passers by. This look simple and nice. Thanks for sharing the lovely pictures of padi field..
Rustic beauty and food cooked from the heart are simple and memorable .. thats a great anecdote your shared Radhika !! Lovely pics ….and chutney looks so so tempting …..
That was an experience of a life time.. I am sure you will always rememeber it.. Btw, Garlic chutney looks great! Ans those pics are really refreshing! That was so sweet of the couple. And a traditional authentic recipe indeed.. So simple.. But must have been very tasty delicious.. My mom also uses iron kadai.. I am thinking of bringing one here when I go home.. Chutney’s Taste when prepared in Ammikal is unbeatable.. Nice clicks..
Nice post! Of course chutney! Wonderful pictures of fields. People in village are always kind and loveable! Tasty chutney…. Nice writeup. Interesting, Like this chutney, seems very authentic. What a lovely experience you had…beautiful pics and thanks for sharing the recipe. Nice post dear… Happy to hear that there are still ppl so generous and loving.. Kudos to that amma… And that recipe looks so yum with so lovely flavors..
Looks delicious and yummy Rads. There still are some good souls here and there…You were lucky enough to meet them…Chutney looks so tempting…And your new mortar and pestle looks good…I have a same one …may be a little smaller in size…i got mine from Mysore…. wow.the chutney looks so spicy and tempting…very delicious!! Lovely write up, beautiful pictures and excellent chutney. Love them all. இந்த காலத்தில் இப்படியும் நல்ல மனிதர்கள் இருப்பது ரொம்ப சந்தோஷமா இருக்கு….புகைப்படங்கள் ரொம்ப அழகா இருக்கு..
சட்னி சூப்பரா இருக்கு,இன்றே செய்து பார்த்து சொல்கிறேன்..
WOW.. A very thoughtful post .. Thats very sweet that you have dedicated it to them..
OMG! I did realize after reading your whole post that this chutney had a beautiful story behind….the chutney is as beautiful as the story…when I was in India…we used to have lot of road trips like this and agree with you about the delicious village food….they know how to cook the real way! Thats a lovely post.. the story abt the old couple is really touching! That was a very touching narration.Chutney looks wonderful. Loved your anecdote and it did tear up my eyes too as I finished it. Thanks for sharing your experience, delicious chutney and pictures. Lovely post and chutney looks so yummy. I’m deeply moved by your story. You guys were truly lucky to meet such adorable couples, god bless. I guess such acts of kindness are common in the villages while strange enough in the cities. While reading your script I was picturing the whole scene in my mind..the cows mooing, sweet smell of jasmine in the air, swaying palms and enjoying authentic food under a mango tree. Oh girl, I miss my home now! I’ll definitely try this chutney! This is a beautiful, touching experience, and a very delicious looking chutney. Can’t wait to try it! உங்க குறிப்பை செய்து பார்த்தேன்,ரொம்ப்ப்ப்ப்ப்ப நல்லாயிருந்தது.விரைவில் என் ப்ளாக்கில் போஸ்ட் செய்கிறேன்..பகிர்வுக்கு நன்றி ராதிகா!! wow love the chutney…colour and flavours as well..shd taste fab..
Nice recipe radhika and I see a great change in your pictures and presentation! Way to go! Very nice,will try for idly soon. Chutney looks yummy and tempting. I liked the addition of garlic in tomato chutney. Very beautiful pictures. i tried ur garlic smoked tomato chattni.. it came out very well.. as u said it suits for roti , dosas and idili… thanks giving this recipe .. Such “lucky unfortunate” event!! Love your encounter and the recipe is fantastic. The chutney looks delicious! And what a touching story. The old couple are really kind. It would be lovely if they could see and read your post on this! Thanks for sharing, have a lovely day! oh…lovely post Radhika…u r indeed lucky to have the tasty food full of love..! chutney looks amazing :), shall try it out.. Regarding peas chaat which you sent to my event, I have included it in another category which I am yet to post, i posted only Pulses category yeserday..!! 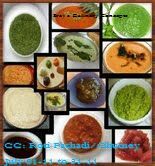 The chutney looks delicious Radhika..would like to try it out. What a beautiful story Radhika! Loved reading about your pleasant encounter with the couple 🙂 And the tomato chutney looks mindblowing! I love tomato and garlic and all things spicy… am totally pumped to try this at home this very weekend! Thanks a lot for the recipe. Tried it out and it was delicious. We enjoyed it a lot, especially my husband. Thanks again. Thank you so much Mamta fro trying out. This chutney is one of our favorites too. Love the chutney recipe which I am going to try soon. It’s so lovely to read about Indian hospitality especially in the villages. Plus you know the saying – dane dane par likha hai khane wale ka naam..